Last week’s death of SeaWorld trainer Dawn Brancheau was both tragic and preventable, and should come as no surprise. This isn’t the first time a captive orca has attacked or killed a trainer, nor is it the first time Tilikum has killed a human being. In 1991, he and two other orcas – Nootka IV and Haida II – participated in the drowning death of Keltie Byrne, a 20-year-old University of Victoria marine biology student and part-time trainer at Victoria’s Sealand of the Pacific marine park. Byrne had slipped and fallen into the orca pool. Tilikum grabbed her with his teeth and dragged her around the pool, holding her underwater for some time. At one point Keltie, a champion swimmer, broke free and tried to climb out of the tank but all three whales took turns pulling her back in. The girl died as Tilikum held her underwater in his mouth. Sealand closed the next year and the whales were sold off to other marine parks. Over the years, SeaWorld trainers in the United States have sustained numerous injuries while performing with orcas, including bites during feedings, ruptured kidneys, lacerated livers, fractured bones, and near drowning. People have even been injured at our own Marineland of Canada in Niagara Falls. In 1986, an orca dragged a trainer around the pool by his leg after he fell into the water during a stunt and an 11-year-old girl required four stitches to close a wound on her thumb after a beluga bit her during a petting session in 2000. In a 2004 report to the United States Marine Mammal Commission (MMC), the University of California found that captive animals had injured more than half (52%) of marine mammal workers. So why are people still permitted to interact with large, wild, potentially dangerous animals? Even the National Marine Fisheries Service has stated that just because orcas and other whales have been born in captivity or have been taught to do a few circus tricks doesn’t mean they aren’t dangerous. This also goes for zoos and circuses that use large, powerful and equally dangerous animals, such as lions, tigers and elephants. People are injured, attacked and killed every year at these places as well. I find this statement laughable, because Tilikum no more volunteered for the “job” than any other animal forced into captivity. But this means he will continue to be trained “to delight audiences” meaning another trainer could end up like Dawn Brancheau. Now Sea World wants to review Brancheau’s death with other facilities (including Marineland) to figure out what went wrong. Common sense should tell them that they shouldn’t be caging, and then playing with potentially dangerous animals! Frustrated animals, prevented from exercising basic natural behaviours, segregated from other whales for days at a time, and forced to live in barren concrete tanks thousands, if not millions of times smaller than their natural environments, will become unpredictable and dangerous animals. So who’s to blame for Dawn Brancheau’s and Keltie Byrne’s deaths? Not Tilikum. Being unable to express his frustration and anger in words we understand, he’s opted to show us. And don’t think that because he’s a predator, he was just looking for something to eat. He didn’t even try eating the bodies. This should tell us something too. Neither are SeaWorld or Marineland (or any place that keeps wild animals captive) to blame. They’re simply trying to make a buck. If the demand wasn’t there, they’d be out of business. So who’s to blame? If you visit or support places that keep wild and potentially dangerous animals imprisoned for your amusement, then you are. Zoos and “Marinelands” are disgusting unless necessary to preserve some endangered species. 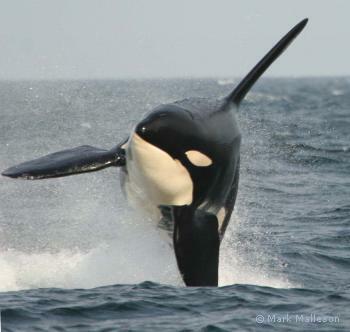 Orcas roam thousands of miles every year and are social animals who live in pods. How would you like to spend your life in the equivalent of a cardboard box – let out a couple of times a day to do tricks? Exactly Linda. I’d be pissed off. And I’d probably let somebody know any way I could. I think that’s what Tilikum and the others are trying to do. These animals are removed – forcibly – from their homes and families and put in the equivalent of a water prison; a bathtub. They’re made to perform, eat and mate when someone else wants them. They have no say in any part of their lives. That’s called slavery. What ‘s more important” People’s lives or vicious animals lives who are not responsible for their actions living in captivity or free??? What common sense does it take to let an animal kill three people and insist that it’s O.K. Perhaps the ones who are making these decisions should sacrifice their families. No doubt being a whale trainer has its risks. Much like any job there are risks involved before accepting your position. Is it more life threatening to be a bank teller, and know that there is a potential (however small) chance of a violent robbery, or working with whales while knowing there is a potential for injury/death? Whale attacks are always well publicized, and anyone willing to work with whales should be well aware of the dangers. Just as a firefighter is well aware of the dangers in his/her line of work. Contrary to what whale conservation propaganda might tell you there is more to a place like SeaWorld than putting on a show for crowds. Yes, that is how they make money, but the facilities are also used for research. Some of this research is being used to save lives of whales in the wild. For example, captive whales allowed for careful hormone monitoring during gestation periods which helped determine that whale gestation periods were longer than previously thought. This in turn forced whaling quotas down, and saved hundreds of whales a year. That’s not even getting into the acoustics and intelligence research of both whales and dolphins which captive animals facilitate. Granted there is plenty of research that simply doesn’t make sense in a captive environment, but there is much that simply could not be done without captive animals. Sadly there are whale species which are critically endangered, and the only way to ensure survival is through captive or semi captive programs. Captive programs of non endangered species have been monumental in teaching animal care techniques without which there would be no way to preserve the endangered animals. I hear you Greg, and I respectfully disagree. Yes, SeaWorld does research on captive animals and yes, some of that research may be useful in helping wild whales, but the reason they do it is the same reason McDonald’s or WalMart gives to charity: it’s good PR. A lot of the research done at these facilities is to benefit the parks themselves, like better husbandry and longer lives for the animals, because it’s good for business and THAT is priority number one. If SeaWorld or Marineland really cares about cetaceans, they wouldn’t be capturing them or keeping them in captivity. You don’t need to cage someone to show them compassion. And both right whales and humpbacks have been rescued from fishing nets or strandings yet nobody has even captured or studied them in captivity. You don’t need to cage whales for people to care about ones in the wild. You mention endangered whale species, but orcas, bottlenose dolphins and belugas are not on any endangered species list. These are the animals being kept in places like SeaWorld and Marineland. Not the endangered ones. I did some time down at Mote Marine Lab in Florida so I know a little about the REAL rescue programs. But with SeaWorld, it’s all smoke and mirrors to make people feel good about supporting animal exploitation. Like circuses and zoos, marine parks needed to justify keeping animals in captivity, so they came up with “education” and conservation” programs to appease the public. Now the public feels better because they believe they’re supporting noble causes but it’s still all about human entertainment. Everything else is just spin and clever marketing. I’d like to know how the owners of Marineland or Seaworld or any other zoo would feel about being taken from their home, put in a cage and told to bounce a beach ball off their noses for nothing more than some raw fish. It’s like living in a bathtub!! One other thing people may not realize is what actually motivates these animals to “perform” these ridiculous stunts. As anyone who has gone to a show at Sea World or Marineland will have seen, the trainer feeds the animals the dead fish from a bucket thereby “rewarding” then for correctly performing a trick. If you ever watch as a sea lion comes on stage, the animals eyes are on that bucket of fish- not on the trainer. Sometimes a trainer will not give the fish reward but might just pat or rub a whale on the side, or stroke their tongue, but that is not a powerful motivator for a hungry whale! The truth is that the main reason why these marine mammals “perform” is because they are not being given enough to eat- purposely kept hungry so that when offered the dead fish, they will do whatever they have to to get their meal. They are given several of these smaller feedings throughout the day coinciding with the show schedule. In the summertime at peak season at Marineland, if there are 8 shows, the daily diet is divided into 8 feedings, and most of the quantity of food is towards the later shows, so that the animals will remain hungry enough to perform. If the whales, dolphins, seal lions (or whatever species) were fed their daily alottment all in one go, they may be satiated and therefore not motivated to perform in the show. So to summize- not only are these animals living in what equates to a bathtub, they are forced to perform unnatural tricks and are deprived food for that purpose. Nice huh! Anyone who walks through the doors of these places is directly contributing to animal cruelty. It’s high time their doors were closed and the animals either “retired” or rehabilitated if possible to return back to the wild, which is where they belong. Im sorry, that comment you said about the whale feeding is completly incorrect. Does my dog turn and walk away after I say the word treat right after a meal? No it doesn’t. Whales will react just like every animal does, when there is food they will eat. Having multiple friends working at Marineland, I know as a fact that the Major feedings are in the morning to ensure they are in optimal condition for the long day. Im not saying that what they are doing is right but it’s certainly not as bad as it could be. Be thankful that they do get food, they have water filters and a decently sized cage. If you want to talk and complain about sizes of cages in comparison to body size, then you should research a chickens cage. (6+ living in one cage, all of which unable to move AT ALL). Be thankful they have wiggle room. I find that after watching (just barely getting through it) the movie Earthlings its very difficult to think about the mistreatment of animals espically those who cant escape it. But then I recall what happen to the ever so famous free willy and how when he was released back into the wild he died. Now adays whales arnt really purchased anymore they are rather traded amoungst various parks like Seaworld and Marineland. A killer whale for 3 Sea lions etc. This can be done because mostly every sea animal in parks today were actually born in captivity so the overwhelming number of animals in their stock means they can push away from purchasing the WILD ones. That I think is slowly reducing the poaching rates and something to smile about because ultimaetly these places make too much money and until they stop they will continue to house these creatures. Just wanted to say your article was incredible as always. You’ve got a real gift for writing! I read your article out loud to my husband and children, and it prompted a big discussion about this entire industry. My husband and kids all agreed with you 100% (and of course I do too). Keep up the great work! Because it’s not as bad as it could be, we should be thankful that animals who normally travel a hundred miles a day have to live in a pool 75 feet across? I think if you had to live the rest of your life in your living room, you’d see things a little differently. Perhaps if you considered whales and other animals as sentient beings, capable of pleasure and misery, desire and loneliness, and not as things (the way you refer to your dog as “it”), you might understand that it’s wrong to keep animals caged for any reason (that includes chickens too). And one more thing Joe. Whales and dolphins ARE still captured from the wild. Although captures in North American waters have declined, they’ve increased in places like Russia, Japan and the Caribbean. he or she came from the wild before that. Remember all those belugas that Marineland got in 1999 and 2002? Where do you think they came from? That’s right. The wild. Why? Because whales and dolphins don’t breed well in captivity. Over 40 whales and dolphins have died at Marineland with 22 animals dying between 1998 and 2005. And they have an abysmal breeding record, with almost all of their newborns dying shortly after birth. The average age of captive-born orcas in Canada is only 3.75 years. That’s why they need to keep replacing them with wild-caught animals (and I’m not even going to get into how cruel and harmful live captures are to the animals taken AND the ones thrown back) . I am glad you watched Earthlings though. It’s a fantastic documentary and I highly recommend it for everyone. It’s just too bad that you still support places that keep animals in captivity after watching it. The only thing that is going to stop the capture, breeding and captivity of these animals is if people stop going to see them.